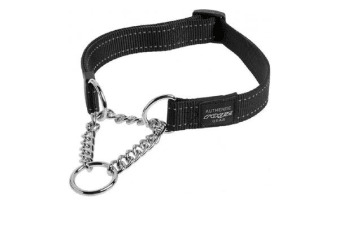 Strong, durable, soft and flexible nylon webbing and stainless steel chain collar. Great for walking and jogging with your dog. If your dog pulls on the lead, it will tighten just enough to prevent your dog from pulling out of the collar. The soft nylon fabric prevents harm to your dog’s neck while still reducing pulling and giving you greater control. Strong, rust resistant, electroplated chrome ring and chain for durable and stable leash attachment. Reflective yarn is woven into the nylon webbing to increase visibility and safety on those evening walks. Fully adjustable collar for perfect fit. Rogz is a South African company that manufactures and distributes a wide range of pet accessories. Their specialties include collars, leads, harnesses, toys, beds, id tags and bowls. Rogz strives to stay ahead of the pack and is one of the world’s most enjoyed and respected pet brands! Want to add a bit of variety to your dogs wardrobe? We have, TippyTap Bow Tie dog collars available and look very cute! And what better way to keep your dog safe and visible at night than with a Loomo Safety Collar Light available in blue, red or green!